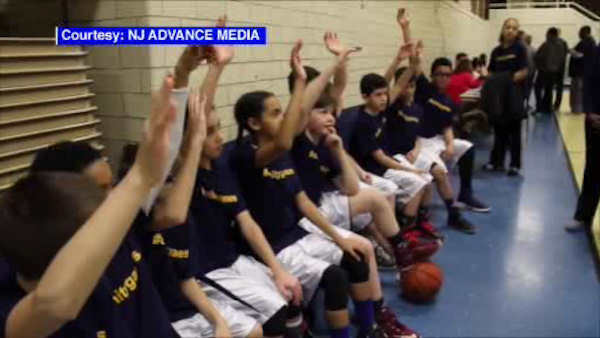 CLARK, New Jersey (WABC) -- A youth basketball team that decided they would rather give up the rest of their season than play without their two female teammates will be allowed to remain intact and will have their record reinstated. CYO league officials had recently notified St. John's in Clark, New Jersey, that their 5th grade team should never have been coed and that their girls wouldn't be permitted to finish the season. The two girls would not have been able to participate in the final two games or the playoffs, and the nine boys decided that was unacceptable to them. When put to a vote before their game against Scotch Plains' St. Bartholomew the Apostle, the St. John's squad unanimously decided not to take the court without their full team. Additionally, the team's prior record was forfeited because the girls were technically playing "illegally." However, the Newark Archdiocese announced Wednesday a reversal, saying it would allow the team to remain together and complete the season. NJ.com was there when the players were told the good news. Rob Martel, coach and father of one of the girls, fought back tears when he told the team that its season was going to continue and they would be going to the playoffs. "This is all we ever wanted," assistant coach Keisha Martel said. "This was never about being defiant or wanting to break, bend or change rules. It was about fairness for these 10 year olds, about finishing the season the way they started - together." Cardinal Joseph Tobin, the Archbishop of Newark, said he believes the team should not have been penalized for mistakes that adults responsible for following the league rules may have made. "We want the children to play for the very reasons CYO sports leagues were established: to provide a source of both recreation and reaffirmation of our Christian faith," Cardinal Tobin said. Vice Chancellor and Director of Communications James Goodness cited more than two decades of the rules and practices in the Archdiocese of Newark CYO that call for boys-only and girls-only teams in older grades, recognizing that some sports feature greater physical contact and aggression as student players age and mature. As a result of his decision, Cardinal Tobin also directed CYO officials to convene a working group to study the current league rules regarding participation and team makeup in all age groups. "We regret the difficulty, disappointment and discouragement that have affected the children, whose growth remains our highest priority and concern," Goodness said. The league will attempt to reschedule the final two games of the season that the team had forfeited.